Finding transparent and straight-forward advice from Google and Bing can often be a challenge. We’ve come to expect search engines to parse information in small bite sized morsels. This often leaves us trying to find the deeper, hidden meaning. So, it was quite refreshing when Google offered up advice to business owners on assessing and hiring SEO experts and agencies in the form of this video. While the video offers some great tips, there were a few places where we thought it best to explain a little more than this short 11-minute video was able to. The following is the transcribed version that contains our added input. Hi. I’m Maile Ohye and I work with Google Search. I’d like to share advice to help you hire a useful SEO and prevent hiring a bad SEO, one who you might pay a lot of money without positive results, or even worse, one who implements shady practices on your website that result in a reduction in search rankings. SEO stands for Search Engine Optimization. To some, SEO seems like black magic. Having worked with Google Search for over a decade, what I’ve learned is that first, it’s not black magic, and second, if you want long-term success, there aren’t any quick magical tricks that an SEO will provide so that your site ranks number one. It’s important to note that an SEO’s potential is only as high as the quality of your business or website, so successful SEO helps your website put your best foot forward, so that it ranks appropriately, in the spot where an unbiased potential customer would expect your site to be seen. Original and well written content. Links to your website from other high quality websites. Authentic business reviews with higher ratings. Business mentions in the press and on other reputable websites. Active engagement on social media. An easy to use and Mobile-friendly website. A technically sound website that is free of coding errors, broken links and utilizes a secure server. As I mentioned, there are many nuances here. Some have a more indirect effect on search engine rankings but are often important to digital marketing as a whole. A successful SEO also looks to improve the searcher experience, from search results to clicking on your website and potentially converting. Strategic and analytical SEO involves understanding the searcher intent behind keywords and aligning that intent with your website content to create a better experience for the searcher. This typically leads to lower bounce rates and can lead to higher conversion rates that increase your leads, sales and other types of engagement. A good SEO will recommend best practices for a search friendly site. From basic things like descriptive page titles for a blog or small business to more complex things like language markup for a multilingual global site. SEOs ensure that you’re serving your online customers a good experience, especially those coming from a search engine, and that your site is helpful whether they’re using a desktop computer or mobile phone. Google has stated they are moving to a mobile first indexing, along with other mobile-centric initiatives, that can affect your rankings for mobile searches. Accordingly, you need to make sure that your website experience is good for laptops, tablets and mobile phones. In most cases, the SEO will need four months to a year to help your business. In most cases, the SEO will need four months to a year to help your business first implement improvements and then see potential benefit. We approach SEO as the long-term marketing strategy that it truly is. 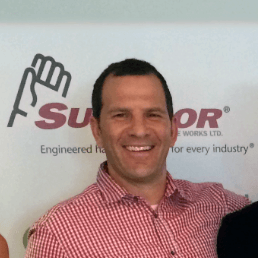 The clients we work with, some for over 10 years now, come to realize this when we work together to produce yearly increases that build lead and sales levels year-over-year. Maile stated earlier that “there aren’t any quick magical tricks that an SEO will provide so that your site ranks number one” and a 4-month minimum time frame is very reasonable. The amount of work that building a solid search marketing foundation is substantial. Sure, you can take short-cuts, but we don’t recommend going that route as your results rarely turn out as well nor last as long. Here are just some of the optimization initiatives that will need to be addressed. Search Audits, Keyword Research and Analysis. Web Development, Coding Updates and Fixing Issues. Analytics Optimization and Conversion Tracking. Content Creation: Copywriting, Graphic Design, Video Production, etc. Content Promotion and Social Sharing. Now consider how many different search terms or keyword segments that you would need to do these for just to catch up with current competition in your industry and market. How much longer if your competitors have an aggressive search optimization plan? 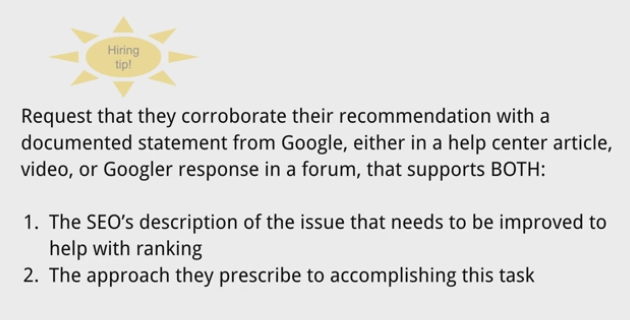 Request that they corroborate their recommendation with a documented statement from Google. Having a written description of the issues we’re facing along with a recommended approach is a good idea. However, clear and straight-forward documented statements from Google are not easy to find. Big “G” can often be vague or provide advice that would be considered very general. There are several credible 3rd-party sources such as Search Engine Land or MOZ, to name a few, that can be counted on for clarity that is often more precise and actionable than Google. Sorry Google, it’s true. Requesting these two bits of information will help prevent hiring a poor SEO who might otherwise convince you to do useless things like add more words to the keywords meta tag, or buy links, because if you search for Google advice on this topic, you’d see blog posts and videos from us that clearly explain that adding keywords to the meta tag wouldn’t help. FYI- The Keywords Meta Tag is no longer used by search engines and Buying Links can get you penalized. There are many other old SEO “Tactics” that, while might have provided value once, are viewed as extremely manipulative and not valid today. Furthermore, while Google uses links for Page Rank, our documentation highlights that we strongly advise against the approach of buying links for the purpose of increasing Page Rank. One basic rule is that in a majority of cases, doing what’s good for SEO is also doing what’s good for your online customers. Things like having a mobile friendly website, good navigation, and building a great brand. Getting back to my point a little bit ago about finding “clear and straight-forward documented statements from Google”, it’s statements like this one above that are very general and common from Google. Additionally, if you’re a more established brand with complicated legacy systems, then good search friendly best practices likely involves paying off some of your site’s technical debt, such as updating your infrastructure so that your website is agile, and able to implement features faster in the long-term. If you own a small, local business, you can probably do the initial work yourself. This statement is a little misleading. Unless you understand HTML code and can make technical updates on your own, then you’d be best to limit your initial work to a few things and find a professional consultant or agency to help with the rest. Creating Content by writing pages for your site or blog. Check out our 30 minute video series on how to build an online presence for your local business. Now, if you still believe you want to hire an SEO, here’s a general process. 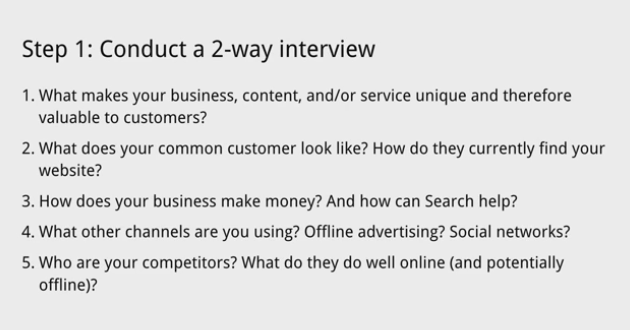 Conduct a two way interview with your potential SEO. Check that they seem genuinely interested in you and your business. Ask for and you’ll probably have to pay for, a technical and search audit. This is a simple, but effective process to follow. Each consultant or agency will have their own “interview” steps so don’t be surprised if something else comes up. The most important things is to have open and transparent conversations about your business and goals. Let’s break this down and start with step one, conduct a two way interview. 1. “What makes your business, content and/or service unique and therefore valuable to customers?” They’ll want to know this information to make sure it’s highlighted on your website for your current and potential new audience. We view the client and SEO relationship as a partnership that is mutually beneficial to both parties. In doing so we want to make sure that we both are on the same page, sharing the common goal of growing their business, and this leads to the 2-way interview. During the interview, be prepared to provide insights as to business goals, your market, customers and any other marketing and digital initiatives. The second step in hiring an SEO is to check references. If your potential SEO provides prior clients, be sure to check their references. You want to hear from past clients that the SEO was able to provide useful guidance and worked effectively with their developers, designers, UX researchers, and/or marketers. In addition to asking for references, find out if the SEO has worked with any other businesses similar to yours or in your industry. The SEO might not have direct experience, but a good one will have enough related experience that they can discuss with you and explain how that experience can apply to your business. A good SEO should feel like someone you can work with, learn from, experiment with, and who genuinely cares about you and your business, not just getting your site the highest rank, as ultimately those techniques rarely last long if they work at all. They’ll want to educate you and your staff on how search engines work so that SEO becomes part of your general business operations. Step three is to request a technical and search audit. If you trust your SEO candidate, give them restricted view, not full or right access, to your Google Search Console data, and even your Analytics data. Before they actually modify anything on your website, have them conduct a technical and search audit to give you a prioritized list of what they think should be improved for SEO. When it comes to Audits, don’t be surprised if some SEOs provide these for free, or have a fee based audit. Just know that free audits are rarely as detailed and extensive as paid ones. The important thing to keep in mind that audits are only one piece of the search engine optimization puzzle. If you’re a larger business, you can hire multiple SEOs to run audits and prioritize improvements, see what each has to say and then determine who you could work with the best. If you do intend on hiring multiple SEOs for audits, then consider making someone the lead on these early on. Otherwise you’re likely to get conflicting or cross analysis. Then you’ll need to figure out later whose is right and what is the best way to proceed. 3. An estimate on the overall investment. In other words, the time, energy, or money it would take for your developers to implement the improvement and for Google Search, as well as searchers and customers, to recognize the improvement. The SEO will need to talk with your developers to better understand what technical constraints may exist. 4. The estimated positive business impact. The impact might be a ranking improvement that will lead to more visitors and conversions or perhaps the positive impact comes from a backend change that cleans up your site and helps your brand be more agile in the future. 5. 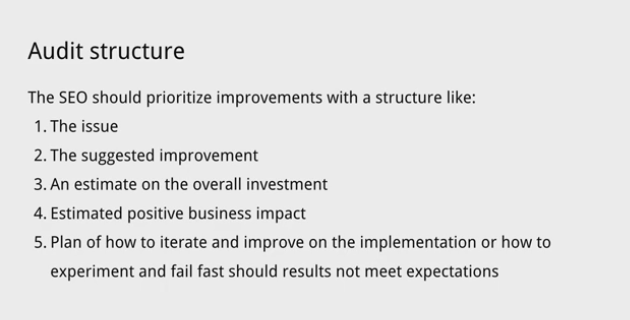 A plan of how to iterate and improve on the implementation, or perhaps how to experiment and fail fast should the results not meet expectations. 1. The issue – Ok, straight forward and should be described in some level of detail. Unless it’s a free audit, then the details might be sparse. 2. The suggested improvement – As with “the issue” above, the detail and insights will vary based on free vs paid options. 3. An estimate on the overall investment – You will see that some SEO Audits will be research and diagnosis only. Working with a developer might not be covered until after the initial audit is complete so that they can scope the rest based on the findings. There are also some SEOs and agencies that have the capabilities to address the finding in-house without going through an outside developer. These are just 2 examples of things to keep in mind that can affect their ability to provide you an estimate initially. 4. The estimated positive business impact – Many items in an Audit may not have a specific “business impact”, such as a rankings boost for your keywords that will generate an estimate of % more traffic and more conversions. However, you should be provided with a valid and reasonable explanation as to what the benefits and outcome will be to your business or website. 5. A plan of how to iterate and improve – Audits are typically one-time initiatives or done at intervals over the course of an optimization campaign. You’re more likely to see iterations and improvements covered in an ongoing search optimization campaign that will take place after the audit is complete. These tend to align with targeted keyword segments and analyzing results to improve as you progress. Don’t be surprised if it’s not covered in an initial audit. That covers the structure of the technical and search audit. There are many more different items and areas of a Technical Audit than are listed here. Our audits have up to 100 different elements that we check. It varies depending on the type of site and sections that we need to analyze. The audit you will receive will also vary by the professional or firm you hire. If they mention that your site has duplicate content problems that need to be corrected, make sure they show you the specific URLs that are competing for the same query. Or, that they explain it should be cleaned up for long-term site health, not initial growth. I mention this because lots of duplicate content exists on websites, and often it’s not a pressing problem. In addition, some elements of an audit will not be as high or a priority to address, and/or will have different costs vs benefits. If you have a limited budget with which to use for updates, ask for a recommendation on how best to move forward with the resources you have available. In the search audit, your potential SEO will likely break down your search queries into categories, like branded and unbranded terms. Branded terms are those with your business or website’s name, like a search for “Gmail” is a branded term while the search for “email” is an unbranded or general keyword. Your own Branded keywords will typically be considered “low-hanging fruit” and easier to rank for than unbranded/general terms. They should be addressed, but don’t overly weigh these as most of your new business is likely to come from nonbranded search terms. An SEO should make sure that for branded queries such as Gmail, your website is providing a great experience that allows customers who know your brand or website to easily find exactly what they need and potentially convert. They might recommend improvements that help the entire searcher experience from what the searcher sees in search results to when they click on a result and use your website. What Maile means here is making sure that visitors who search for your brand keywords find the pages in the search results that match the intent of their search. An example of this would be if you are Amazon.com and a searcher uses the keyword “Amazon kindle” that pages of your website related to Kindles show up in the search results. In this example, relevant pages for both Kindle eBooks and Kindle E-readers are showing up. You’d expect these pages to be here and they are. Non-branded keywords should require the majority of your SEO time and resources. They will be more competitive and harder to rank high for than brand queries. They will usually also generate more of your new business as they are likely to be used by people that have not yet been exposed to your company. For instance, perhaps your competition has great reviews, really shareable content, or they run a highly reputable site. An SEO will provide recommendations for how to improve ranking for these queries and the entire searcher experience. They’ll introduce ideas like Update Obsolete Content. They might say, “Your site is suffering because some of your well ranking content is obsolete, has poor navigation, a useless page title, or isn’t mobile friendly. Let’s improve these pages and see if more website visitors convert and purchase, or if they can micro-convert, meaning that perhaps they subscribe or share content. Content is Obsolete – It’s quite common for a website to have outdated content that is not as relevant today as it was when it was originally published. When searchers find these pages then typically convert lower and have a higher bounce rate as the visitors leave to seek more accurate into. You can assess which pages might be “Obsolete” by comparing them against other pages on your site for things like bounce rates, time on page, and conversion rates from search engines. You can also assess which keywords that visitors used to find these pages in Google Search Console and Bing Webmaster Tools. If you see search queries with intent that does not match the content, then you can update the content to reflect searcher intent or reoptimize the content for other keywords. Has Poor Navigation – Navigation has 2 different aspects that affect your website. The 1st is related to SEO. Through intelligent navigation you can control your website links to optimize and sculpt for page authority (AKA “PageRank”), create groupings of topical segments (AKA “Information Architecture”), and emphasize (and deemphasize) areas that align with your overall search engine optimization strategy. The 2nd has to do with the User Experience (UX) and Website Conversions (CRO). Updating a page’s navigation can improve your visitor experience and conversion rates. Keep in mind that search optimization is a different skill set than these two, and while an SEO professional may be able to help you with these, they will usually be limited in what they can handle. However, some marketing agencies, like ours, have team members who are more experienced in UX & CRO and can address these areas with greater detail than a typical SEO. Make sure to ask your consultant or company about this to better understand their capabilities, strengths and limitations. Useless Page Title – HTML “Meta” Page Titles are the headlines for you page listings in the search results. They act a summary for you page for both searchers to identify what the page is about and also are a significant component of a pages weight in search algorithms. If your Page Titles are misleading or irreverent your SEO will help you create new ones that should better match the content of the page and keywords you want it to rank for. Isn’t Mobile Friendly – As mentioned earlier, Google has made great progress in addressing the growing mobile user segment since it surpassed more than 50% of all Google searches. Even though mobile usability can have some effect on your search rankings, mobile UX is largely done by specialists or agencies who have dedicated team members with development skills to optimize the mobile version of your website. Don’t be surprised if this is something that you need to bring in a developer to assist with. Let’s improve these pages and see if more website visitors convert and purchase – As mentioned above, Website Conversion Rate Optimization (CRO) is a different marketing specialty than SEO. A good SEO can help you identify poorly performing pages and make recommendations to improve them, but their ability to improve conversions will likely to be limited. Again, ask your consultant or agency about this. This is good advice and should be a staple for any SEO. I covered it above under “Has Poor Navigation”. It’s worth noting that a significant piece of Google’s original algorithm was how the web links from one page to another, and one website to another to make up their “PageRank” linking component. This was meant to add an authority and popularity element to their rankings that, at the time, no other search engine had implemented as fully. This aspect of their algorithm is what made their search results better than everyone else at the time and helped Google reduce spam and manipulation. Ok, “generate buzz” is not something that SEO’s normally say. It’s more in the realm of general marketing speak with little nuanced meaning for search optimization. Now getting social media shares can help your content get indexed by Google through Twitter, and get you in front of a larger audience (aka build relationships). That can, in turn, help you build natural links to your content that can help you rank. So be aware that if your consultant or agency keeps talking about “generating buzz”, you might not have the most experienced SEO. Competitor Analysis can be done for any digital marketing campaign, SEO, social media, paid advertising and more. However, there are a few specific areas that you can analyze your competition for that directly relate to SEO. Keyword Ranking Analysis – Understanding where you rank in comparison to other sites will help you understand where competitors are already at and how growth you need to do to catch up to them based on where you are listed for the same keywords. Ranking analysis can be done manually by searching Google or you can use a ranking reporting software. There are several services available. Link Analysis and Site Authority – Since site authority and links play a significant role in search engine rankings, analyzing your competitors back links can give you an understanding of their content that is doing well to attract them, and the sites that they are getting their links from. If you can obtain links from some of the same sites the competition has, then you can start leveling the search playing field so to speak. Content Analysis – When you start to get into planning your site content for SEO purposes it is a good idea to analyze and compare your site content to your competitors. This can be done by simply comparing your pages to the competition and identifying the gaps in pages (opportunity). Then by assessing if those content types are viable for you. Deeper content assessments can include backlink analysis, social engagement data, individual page rankings, keyword makeup of pages and more. Again, a good SEO will try to prioritize what ideas can bring your business the most improvement for the least investment, and what improvements may take more time but help growth in the long-term. Once they talk with you and other members of your team such as developers or marketers, they’ll help your business forge a path ahead. This is some pretty solid advice. It highly likely that you have a full range of products or services, but some are more profitable or lead to more business that you may want to focus more on. Prioritizing these will help determine which ones to devote more of your SEO resources to. You should also keep an open mind to what the keyword research data reveals. There is likely to be higher volume areas that people are searching for that your business is missing out on that you didn’t know about. A great SEO will always help you identify these and plan additional initiatives to help your business grow in new areas. The last thing I want to mention is that when I talk with SEOs, one of the biggest hold ups to improving a website isn’t their recommendations, but it’s the business making time to implement their ideas. If you’re not ready to commit to making SEO improvements, while getting an SEO audit may be helpful, make sure that your entire organization is onboard. Else, your SEO improvements may be nonexistent, regardless of who you hire. That wraps it up. Thank you for watching and best of luck to you and your business. Another great piece of advice. When starting SEO with any agency or consultant it’s best to have honest conversations with them about what it’s going to take for you to help them achieve the desired goals. If you and your staff don’t have much time to invest then the SEO should be made aware. They might even be able to propose a different service offering to help support the resources that you don’t have available. It may cost you more, but this way you’ll be able to work out a plan that everyone involved understands. I hope the added explanations has clarified some of the generalizations and added deeper insights into how these areas actually impact SEO. If you have any questions or need further input, please feel free to contact us or leave a comment below and we’ll make sure to follow up with you.